Significantly reduces testing and data acquisition time. ACQIRIS , a leading manufacturer of data conversion instruments, has introduced the world's first 10-bit, 4GS/s, 3U PXI digitiser, with input bandwidths of up to 3GHz. The dual-channel DC152 and single-channel DC122 digitisers significantly reduce testing and data acquisition time, making the new digitisers ideal for high-speed applications such as telecommunications and semiconductor testing, where test time should be limited only by the speed limits of the device under test (DUT). In addition, the input bandwidth of up to 3GHz makes these high-precision, high-speed digitisers ideal for use in synthetic instrumentation systems for the replacement of standard digital multimeters, oscilloscopes, power meters, and frequency counters in RF and microwave test systems. The DC152 and DC122 digitisers are fully compliant with both the PXI and CompactPCI standards, and are supported with AcqirisLive and AcqirisMAQS software and Windows, Linux, and VxWorks drivers for easy integration into production test and automatic test equipment (ATE). The single-slot, 3U PXI/CompactPCI digitisers incorporate Acqiris' proprietary XLFidelity and JetSpeed II ADC chipsets, introduced earlier this year. 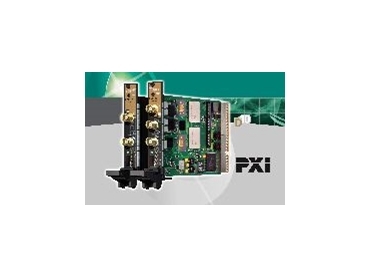 The XLFidelity ADC front-end chipset integrates the signal conditioning, amplification and interleaving functions essential to high-speed data acquisition into two companion ASIC devices. The JetSpeed II chipset is designed to enhance high-speed ADC performance through the distribution of accurate timing signals, and synchronously pass the acquired data to onboard memory. The DC152, with 2GHz of bandwidth, provides synchronous sampling of 2GS/s on both input channels with up to 256 Mpoints of optional acquisition memory; in single-channel applications this doubles to 4GS/s and up to 512 Mpoints. The single-channel DC122 offers sampling rates of up to 4GS/s with 512 kpoints of standard, or 512 Mpoints of optional acquisition memory. It also offers the choice of standard or high frequency front-ends that can be selected at the time of order, tailoring the digitiser module to the user's needs. The 50Ω input stage of the DC122 standard front end is fully protected against overvoltage signals. The XLFidelity programmable front-end electronics are used to provide a complete set of input voltage ranges, from 50mV to 5V full scale (in a 1, 2, 5 sequence) with variable voltage offset. With a bandwidth of 2GHz, the digitisers provide optimised amplifier response (flatness, overshoot and accuracy) to ensure the precision of high-frequency measurements. The front-end circuitry features switchable filtering, very fast recovery from out-of-range signals, and internal calibration, so there is no need to disconnect input signals. The DC122 high-frequency input front end gives direct access to the XLFidelity cross point switch in order to benefit from the full bandwidth of Atmel's TS83102G0B ADC used in the digitisers. The full-scale range is fixed at 1V, providing a bandwidth of 3GHz. The input channel has an overvoltage protection to ±3V.